One thing that has been important to me for years now is supporting the local homeless shelter. Actually, supporting women’s shelters, assistance programs, soup kitchens, and any program that help those in need is a priority for my family. Since homeless shelter needs are often overlooked during summer months, I wanted to share some tips and first-hand experience on what is often needed but frequently forgotten. A few years ago, I was involved in helping local men and women learn how to coupon and support their families on lower incomes. During that time, I offered countless hours of help to hundreds of men and women in my community that struggled to make ends meet. Some of them were working full-time but just didn’t make enough at their minimum wage jobs. Others had no job and were facing homelessness. In the midst of this time, I became involved closely with our local Salvation Army. While I already had a great deal of understanding and compassion for the plight of the many who came to their facility daily, I grew even more concerned for our local community. So many men, women, and children struggle every day for basic needs. In fact, I found that in our city there are many who get that singular meal 3 times a week when served by the Salvation Army, and then a single sandwich lunch served by another area charitable organization Monday-Friday. Many of these men and women on the streets don’t have a meal on weekends. Many, are left without a place to call home, a roof over their heads, or any food. Let alone basic things like toiletries. A toothbrush, toothpaste, soap, feminine hygiene products, and even deodorant or shampoo are even more difficult to come by for man. 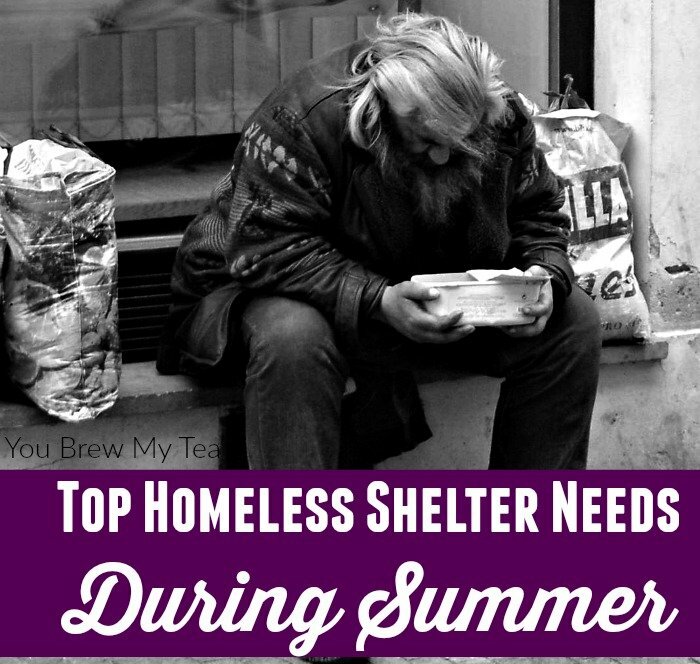 This simple list of homeless shelter needs for summer is a way for you to effectively help those in your own community. This can be great not just for a homeless shelter, but also for women’s shelters, soup kitchens, church pantry, and other community outreach groups. Bottled water. Also needed are Gatorade, Powerade, and other electrolyte drinks. Juice boxes for kids. These are also great for them to give to diabetics who may need a sugar boost. Reusable water bottles or canteens. This helps them carry water with them all the time. Reusable water bottle styles with lanyards or hooks that can attach to their belt loop are best. Feminine hygiene products. Pads, tampons, pantyliners, and even baby wipes for easier cleanup are all needed consistently year round. Small packages of baby wipes are easier for them to pass out and for those in need to store on their person. Summer skin protection. Bug spray, sunscreen, aloe vera gel, and anti-itch creams or ointments like Calamine, Afterbite are all a huge help. Pet food. Many individuals have dogs for companionship and protection. In fact, many find a stray dog comes to them when they are on the streets. Pet food is always a great donation as some homeless will simply share their meals with their pet. Non-perishable snacks: Beef jerky, beef sticks, trail mix, nuts, granola bars, and cereal bars are all easy to eat and don’t require refrigeration. They are also available in single serving sizes that make it easy for the homeless shelter to pass out. Children’s fruit snacks are also a great addition for kids and for those who need a sugar boost for blood sugar reasons. Avoid products with chocolate that could melt in the heat. Reusable grocery bags. A cloth bag is nice, but waterproof is best. We love the collapsible bags that can be tucked into a pocket when not in use. First aid kits. Small portable options with basic bandages, antibiotic cream, alcohol wipes are needed. Sewing kits. Small sewing kits with needles, variety of thread, and even patches for worn clothing are often wanted. Playing cards. Playing cards can be purchased in bulk, and are a great addition that helps pass the time. Diapers and baby food or formula. These are needed in all sizes, styles, and stages for infants up to toddler sizes. Formula and food should have extended expiration dates and not require refrigeration. OTC medications. Tylenol, Advil, Benadryl, Tums, and even Multi-Vitamins are often requested. Umbrellas. They are good for rain, but also to provide shade in the heat of summer. Popsicles. Many homeless shelter locations like to have these on hand to give to kids and as a special treat in the heat. The shelf stable variety you can store out of the freezer until ready to freeze is best. Socks and underwear. These are always a need for men, women, and children. Traditional boxers are best for men. Traditional briefs for women. Also, inquire about bra needs. Sports bras in multiple sizes are often the best and most affordable choice to donate. In summer, ankle socks are more popular. Handheld battery operated fans. These are often found near the checkout counter or in dollar stores for $1-$2 each. They are a great addition to a donation, especially if you can find in bulk quantities at a more affordable price. They also make small desk fans that work great for this purpose. Batteries. Any and all sizes, with a focus on AAA and AA for use in things like fans, small radios, and similar. Small kids toys. Activity pads, small boxes of crayons, coloring books, handheld games, small cars or even dolls are all great additions that many locations only see during the holiday season. Books. Paperback books in all genres, Bibles, and magazines are almost always welcome. Stationary supplies. Paper, notebooks, pencils, pens, envelopes, and stamps are much needed. Stock up on extra during back to school time. Fresh fruit or vegetables. A bag of apples, oranges, bananas, or other easy to pass out fruit are always welcomed. Small packages of things like carrots are also nice to have and hand out. Your time. If you don’t have a budget to purchase items, you may be able to give your time. Helping organize their pantry, assist in serving meals, answer the phone, do filing, clean the building, or even teaching a class if you are equipped to do so can all be a huge blessing on the homeless shelter or soup kitchen in your area. 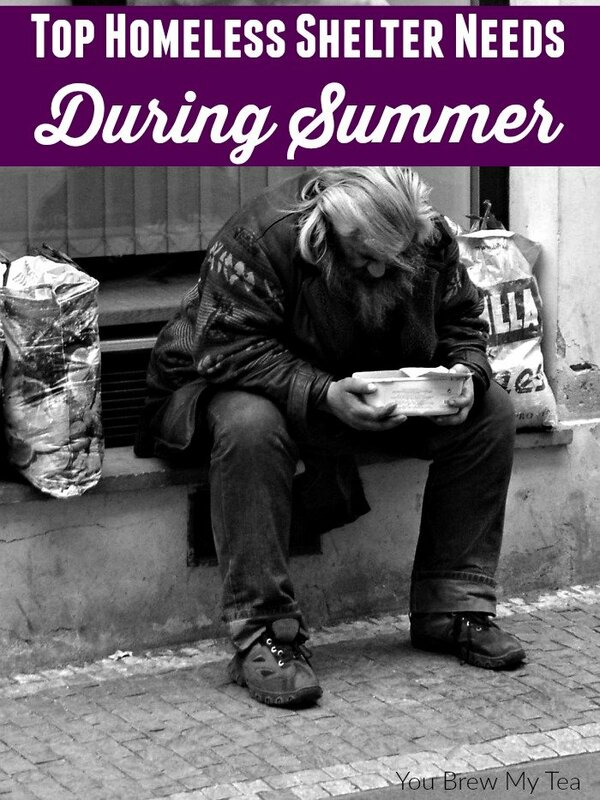 As I talked to many who help out in our local support locations, I found that there are tons of donations in winter months, but summertime can be much harder. There are many needs that can be met with just a few minutes of your time, or dollars from your budget. I’ve included links to many items available online in bulk that can be purchased from the dollar store. This gives you a chance to order items and spend even just $10 per month and still impact your community. Donating items or time to a homeless shelter isn’t about receiving a pat on you back for what you did. It is about loving humanity. We can sit and talk for hours about the reasons people are homeless or in need. I have many thoughts personally on how we can make changes to help more people get on their feet. However in the moment, it is not our place to judge, but to help. As a Christ follower, I believe that he taught us by example to not pick and choose who we helped, but to show love and compassion to everyone. He said to feed and clothe those in need, and that is why I try to work in my community to help when I am able. We have often been limited in funds or even time. Sadly, I have not given as much as I would like to, but even one box of food here and there can and will make a big impact. Do what you can to fill the needs of the local homeless shelter or charitable program in your community this year. This is a fantastic post!! Thank you for the reminder. Seems like we tend to think of the needs of homeless people in the winter more than the summer. I’d hate to be outside without water or sunscreen. Sharing on Poofing the Pillows’ Facebook page on Sunday. Thanks for joining Thoughts of Home on Thursday. We are glad to have you. Such a thoughtful post. Thank you for sharing with us at #HomeMattersParty . We would love to have you again this week. For the past 7 years, my friend, my husband, and I run a food pantry at our church (and have been volunteers since 2006). Many of our guests live on the river or in homeless camps. After doing Katrina relief in 2008, we started making “snack packs,” which consist of a gallon ziplock bag with a beverage (usually bottled water or a box drink), Vienna Sausages (beef jerky is difficult to chew if one does not have good dental care), ramen cups, individual bags of peanuts (usually 2/$1 at convenience stores), protein bars, fruit or applesauce cup, cheese cracker sandwiches, pop-top cans of stew/beef-a-roni, cup-a-soup, individual packages of unsweetened cereal, individual servings of tuna and crackers, instant oatmeal, poptarts, breakfast bars, a couple of hard candies, etc. We include a paper napkin and a plastic spork and knife. We focus on protein-rich foods and try to minimize sugary/junk foods but we use what is donated! Thank you for the information! Thank you most for being so willing to reach out to help others who are in need in your community.